EZ Mount Heater/Circulator - Gilson Co. This versatile HM-649 EZ Mount Heater/Circulator combines circulation and temperature functionality into a single compact and portable unit. The device mounts easily and securely to straight or curved tank and bath walls with an adjustable clamp, and can quickly be dismounted and moved to another tank. Streamlined design maximizes available tank space. Design features include push-button controls and easy to read 3.25” LCD backlit display with on-screen prompts. A convenient sliding control adjusts flow rate. Tough plastic protective housing guards the pump and heater, and is easy to keep clean. Over-temperature and low-liquid level shut-offs are set by user to assure safe operation. 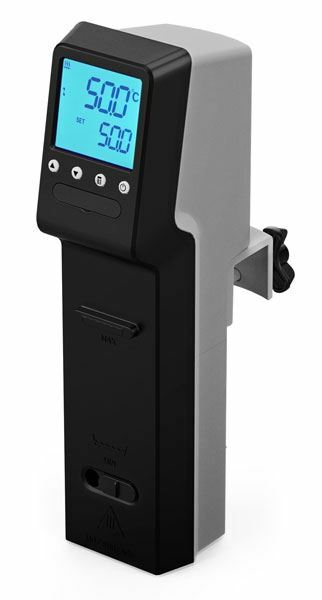 With 1,100 Watt heat output and adjustable pump flow up to 3.4gpm (12.8Lpm), the HM-649 heats and maintains tap water in SGA-120 and SGA-122 Water Tanks to the required temperature range for specific gravity applications. For smaller tanks up to 7.4gal (28L), temperatures are controlled to ±0.13° from ambient + 20° to 212°F (±0.07° from ambient + 10° to 100°C) in water. Maximum flow rate for model HM-649F is 2.8gpm (10.6Lpm). Both models suitable for tanks with a working depth of 7.25” (18.4 cm) or more, using tap or distilled water only. Two-year manufacturer’s warranty. Supplied with a 5ft power cord with grounded plug.